The true and prime leader of all monks dedicated to Anathema practice (Buddhist insight meditation) in Thailand. 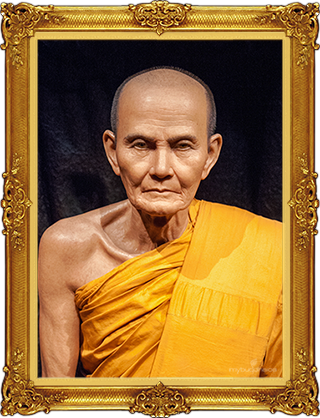 Achan Mun Bhuridatto Maha Thera was born on 20th January 1870 (BE 2413) in the small farming village of Baan Kham Bong, Ubon Ratchathani, Northeastern Thailand. He was the eldest of 9 siblings. His father’s name was Komduang and his mother was named Jan. As a youngster his uncle took him to meet Achan Sao who introduced him to the basic principles of Samadthi. He became a novice monk at aged of 15. In 1892, at aged of 22 he was ordained as a Buddhist monk at Wat Liap and was given his formal Monks’ name of Bhuridatto. His early training and tudong was with the great master Achan Sao Khantasilo who taught him the secrets of Vipasanna and Khamathaan. Achan Mun and Achan Sao attracted a large following and soon established a traditional form of meditation known as Khamathaana. His only goal of course was to reach enlightenment. It is said that Achan Mun obtained the high level of Samadthi known as anagami in a cave located in a mountainous region known as Khao Yai. During the late 1930’s shunning modern ways Achan Mun spent many years in and out of the Karen region which borders Burma, Thailand and Laos in pursuit of enlightenment. Achan Mun loved to teach the people Buddhist principles known as Kaan Phut. In 1940, he resided at Wat Baan Nong Pue and often visited some old familiar grounds and eventually returning to Wat Pa Sutthawat. Due to poor health could no longer go tudong. 1. His robes were only ever made from the shrouds of deceased. 2. He liked to go Pinthabat (morning alms) each monrning. 3. He would only eat one time per day. 4. He only ever eat from his own bowl and never from a plate. 5. He would sleep only 4hours per night 11pm-3pm. 6. He liked to meditate in caves, cliffs or remote forest. Achan Mun passed way peacefully on 11th November 1949 (BE 2492) aged 79 years. His disciples placed his remains in Wat Pa Sutthawat. Location: Wat Pa Sutthawat, Sakon Nakhon province.